Killing time before an event in London, I was wandering around the Tottenham Court Road area. 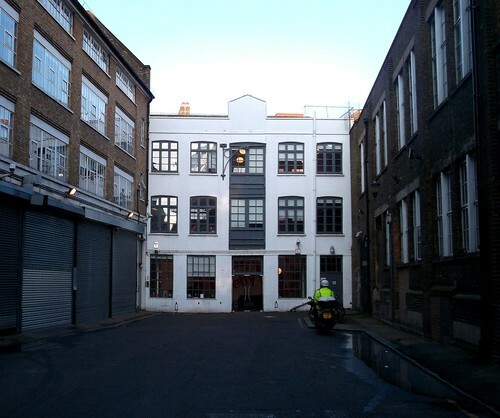 Looking down Alfred Mews, I spotted this warehouse at the end of the road. Restored and converted to offices, it's still not a bad example of the sort of industrial building found in big cities in steam railway days. You can see more on Google Streetview. 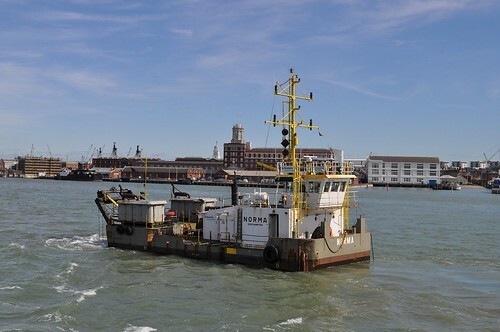 Sticking with the "ugly things with girls names" theme, how about this I spotted in Portsmouth harbour a few weeks ago? 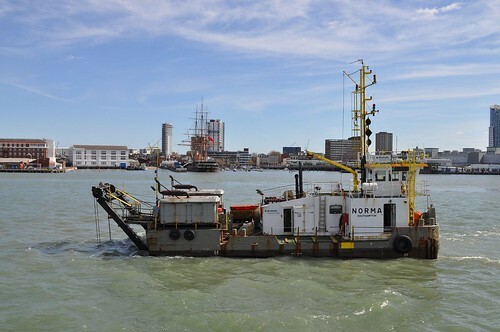 Norma is a dredger built in 1981 by Motoren and Machinefabriek Van Boelen in The Netherlands. I know this because I found the spec sheet online. 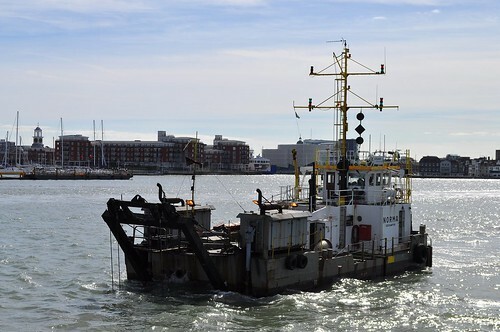 Her current position and activities. Personally, I just thought, "What a fantastic looking boat". No fine lines but loads of interesting character, and yes I'd love to build a model of her. 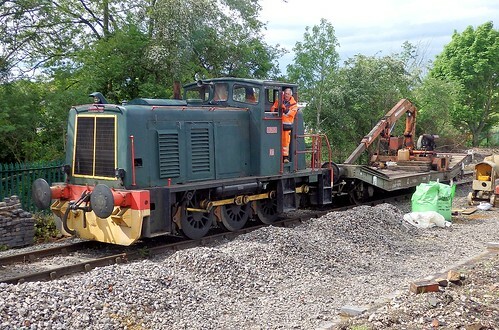 Waiting for the Last Day of the Bubble Crs event to start, everyone was kept entertained by the Chinnor & Princes Risborough Railway who had Ruston Hornsby 0-6-0 "Iris" running with an unusual train consisting of a LOWMAC fitted with a hiab crane. Operating in proper working condition, Iris is a fine looking loco, not unlike the BR Class 07. 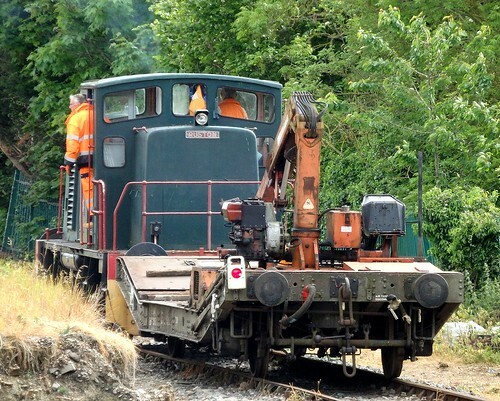 Nice to see an industrial diesel still earning its keep! 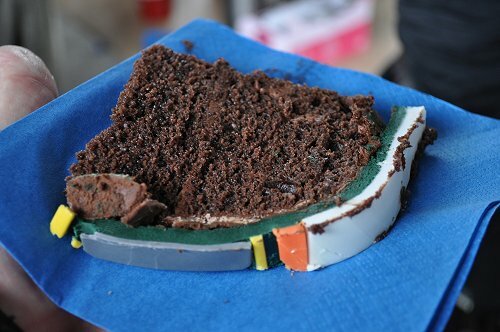 Last week, Nick Brad was a concerned about the recent lack of cake action on this blog. 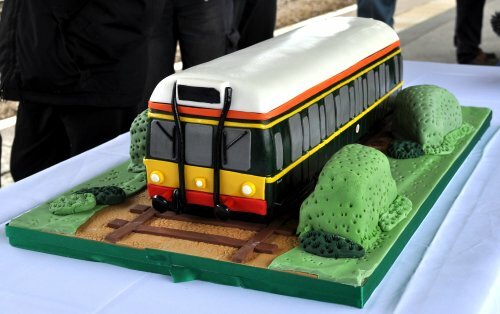 Always one to keep my readers happy, I bring you details of a genuine railway cake. And then served up to those who had made the trip to a damp Princess Risborough station to witness the final running of these venerable machines on the national rail network. A rather nice little film showing a rolling and straightening machine made from Meccano. I own a couple of sets of rollers, but the adjustment handle is rather more handy than the alan key screws I have to use. Pity this isn't robust enough for serious work! My formative years involved technical Lego rather than Mecanno, but I never fail to be impressed with the ingenuity of builders working with Frank Hornby's "toy". Nor do members of the non-modelling public, the models always attract interest even from those far too young to have played with the stuff in the past. Readers of the current issue of BRM who make it to the back page will find out that I'm going to be picking up some new work in a couple of months. In July, I take over as editor of both Garden Rail and Engineering In Miniature magazines. As regular readers will know, I have a long background of messing about in the garden. Admittedly this is mostly at the home-spun make and do end of the hobby, but I'm sure I can understand the high-end live steam world too, especially once I get to have a go at it! Engineering is a little different. My visits to marvel at the exhibits on show at various ME shows through the years are documented on here, but I can't claim to any skills at lathe work. Fortunately, my role is to assembled the content rather than machine a casting. Mind you, if anyone fancies showing me how, I'm definitely up for it. I've some big boots to fill with all this and in many ways it's a new direction for me. You don't get rid of me from BRM, I'll still be spending plenty of time building away there and I'm expecting plenty of cross-over between the three publications as well. Now if you are reading this and thinking, "I wonder if Phil would be interested in an article on...", the answer is yes. Drop me an e-mail and we'll talk about it. After all, I have a contributors budget to spend. You'll not get rich but it's very satisfying to see yourself in print and you can be sure of support from an editor who remembers how he was helped along the way. This blog? Hopefully all will continue as before. Overall, I have a full-time job with all this stuff and should be able to do a few more projects to fill it. I've 2 lined up once I've finished the Wickham for a start. There will probably be a few more newsy posts and perhaps some talking about places I've been for work. 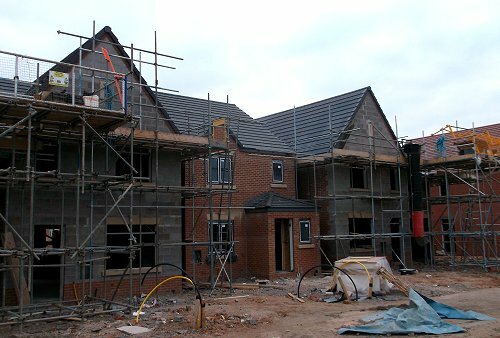 A similar mix to what we've had recently. I'm not sure who is writing the advert for BRM at the moment, but I need to have a word with them.
" 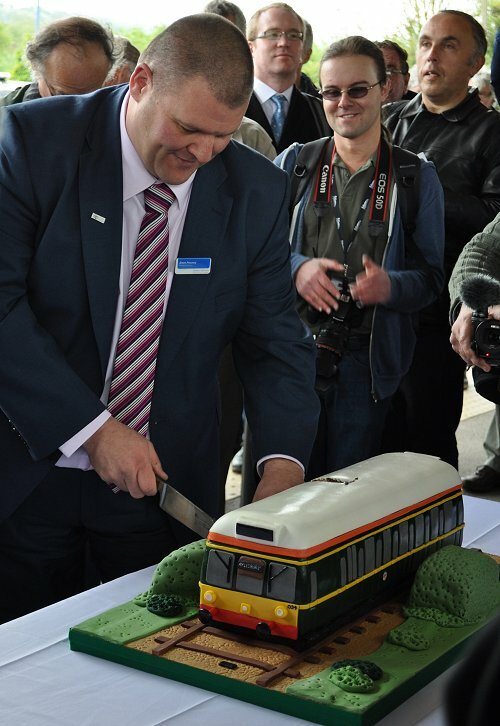 Phil Parker's fondness for a brew is only outshone by his appetite for modelling. Here, he manages to combine both." Seriously, I might have the odd sweet sherry at Christmas (not a whole glass, don't want to go mad) but there's no call for that sort of thing! Anyway, I've been trying to work out how to load barrels in the back of railway wagons. This should be an easy job, but it turned out to be far from this. I had to build a wagon along the way to load, so there's bonus kitbuilding. Oh yes, I worked in two scales too. The barrel loading is to tie in with one of the layouts - Woodlands Brewery. I've been out with the camera again and shot David Carr's model at Kettering O gauge guild show. It's a lovely layout, very much my kind of industrial scene. Last month, I built a laser cut kit signal box. Painting bricks made this way has always defeated me though, but I wasn't able to get out of it this time, so after a lot of head-scratching and some experiments, I've developed a method that is quick and easy. The DVD is fatter than normal with over an hour's footage on it. 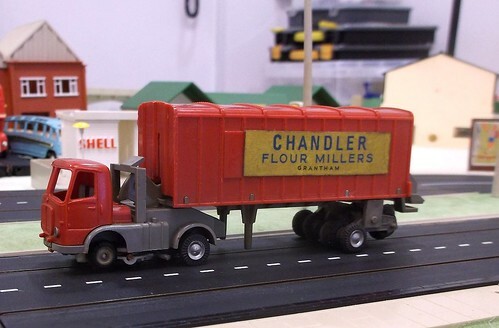 In the practical section, you'll find me improving some diecast road vehicles. 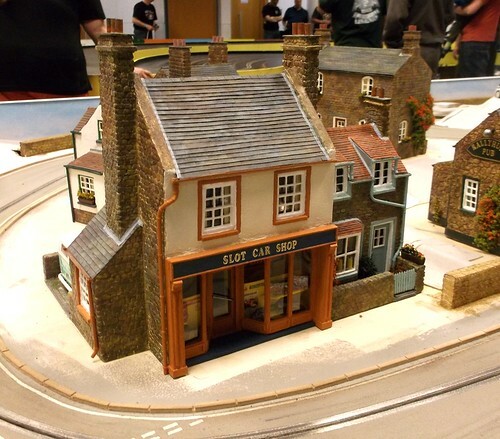 Subscribers get a bonus feature on the Melbridge Box Company, my micro layout. 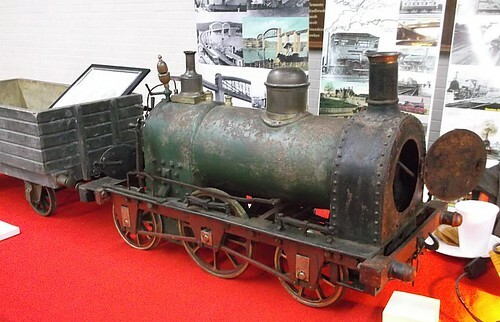 All new photos and words on the subject including plenty of locos not seen on the model before. Oh, and I wrote the Tail Lamp column too, but we'll talk about that tomorrow. Update: If anyone fancies a nifty little workbench, there is a good subs offer on. I've assembled the kit here. 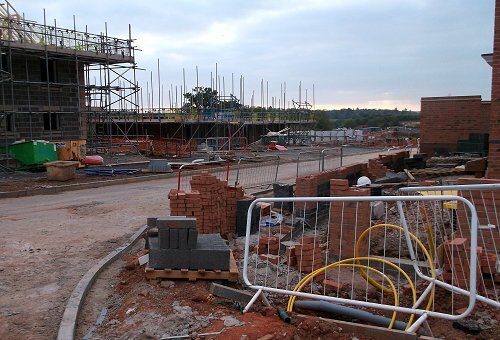 There's a lot of building going on around here and a few days ago, I took a stroll around some of the sites. 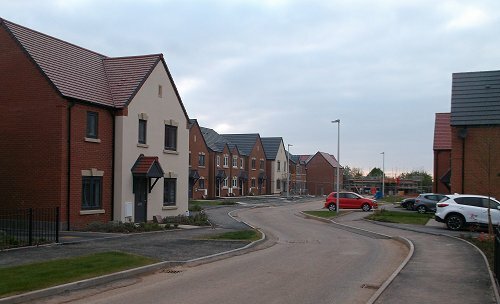 They already have residents so there is an interesting mix of finished and part-built houses. I'm fascinated by early photos showing the place I live just after building in the 1950s - a very different world. 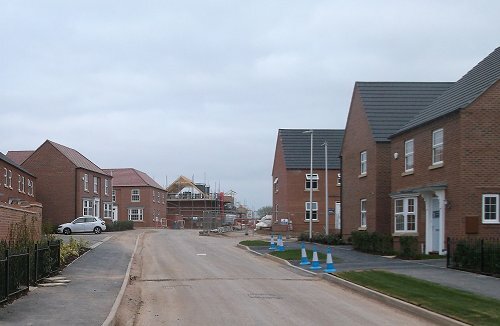 Newer estates have gradually mellowed and become established and I'm sure these buildings will do the same. 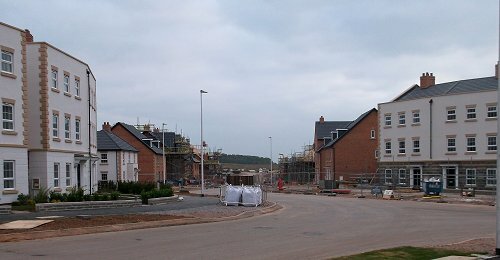 The top view will definitely change as it gets "lived in" although probably by the roads filling with parked cars. Some of the houses are already spilling over into the road in this respect. A rather complicated project for HCC magazine Number 111 - Spring 2017. 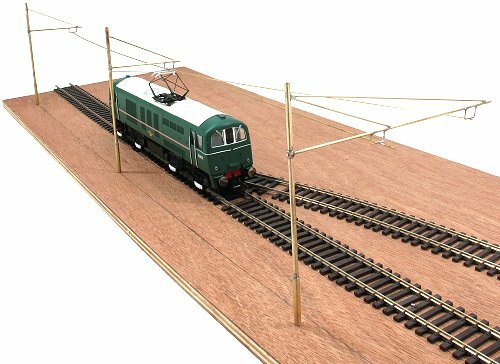 With the arrival of the Hornby Class 71 electric loco, people are likely to want to run it over the appropriate 3rd rail setup, or if in a yard, under the wires. 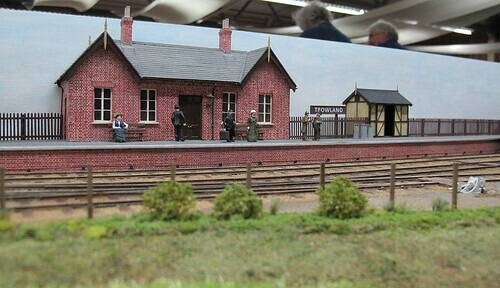 With the experience of install rail number 3 on his layout Abbotts Barton, Andy Hopper explains how this can be done. This leaves me with the overhead wires. Now SR catenery in yards is somewhat lighter than the stuff you find on the main line. 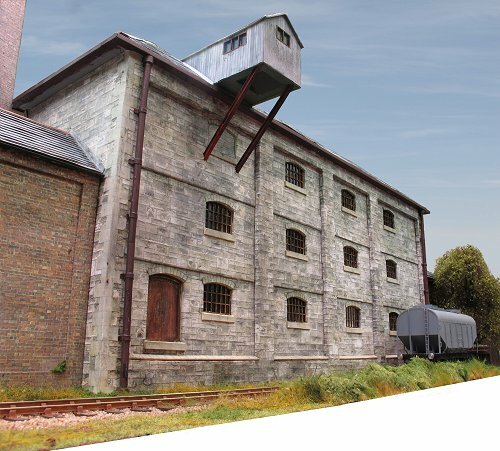 It's far more like tramway overhead, not a million miles away from the version I installed on my model of The Hellingly Hospital Railway. Well, there were two designs and the most common version looked like that. All (!) I had to do was make up some poles and wires from brass tube and rod. It's not the easiest job in the world, well the poles aren't too bad but the contact wires are a pain. Tension is essential and I wasn't going to make an entire layout which made anchoring the ends for the finished photo tricky. So there I was having to change trains at Banbury. It was approaching 4pm, so I though, "I'm in no rush, I'll wander along to Trinders." 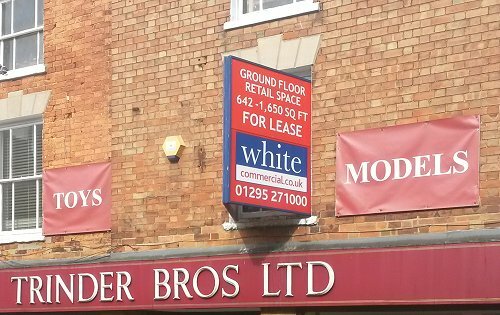 It's an excellent in-town model shop where I've enjoyed many a happy session perusing the shelves and left much of my money behind in return for exciting products. Oh no! It's gone! Another model shop casualty. A closer look revealed that they hadn't gone, just moved down the road slightly. The new shop incorporates the existing cycle store and adds a snack shop for some reason. Inside, the previous generous space given over to models has been compressed. I'm sure there is less stock, but not as much as you might think. The shelves got up a lot higher for a start. Some more specialist ranges have been trimmed a bit, I bought the last O gauge wagon kit in the shop for a start but then I doubt there was ever a rush for these. The huge range of glues and paint is stil behind the counter, you still get Hornby and Bachmann stock, some at impressive discount (J15 £99) and scenic materials and wood are still for sale. I suspect that the odder items have been sold off though. They still have a very large aircraft centre cap for a propeller in white if you want it. How that ever made it into a general shop stock I don't understand. Everything being on one floor allows for embarrassment free looking at the toys too. Well you never know what might come in useful! A common whine from people who take a brief break from their computer screens to venture into daylight and visit an exhibition is "I didn't see anything moving". Seasoned exhibitors know that this is usually because they only allow a nanosecond for each layout between extended spells examining boxes on trade stands so we just ignore them. Well, even the hardest core webmoaner couldn't fail to see something running at G Rail. Loads of layouts with great big, both in length and scale, trains trundling around for the entertainment of the visitors. Quite frankly, if you brought the average "normal" family to the show, they would have left delighted. Starting with a massive Playmobil layout that kids can operate with radio control, there were several LGB setups and of course some live steam on a test track. OK, so pretty much everything is circuits laid on baseboard only just big wide enough, but you certainly got close to the action. Most people try for some perfunctory scenery but it's an area largely unexplored here. G Rail is about people who like trains having fun.Maybe that's why everyone was so friendly? That's not to say there isn't quality modelling. Just inside the door was the competition with some absolutely superb entries. The quarry Hunslet at the top of this post is a GRS kit with superb paint and extra detail. 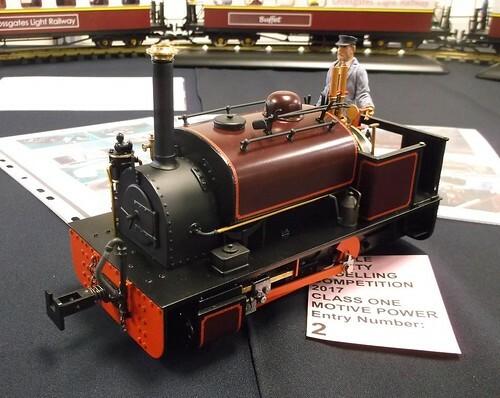 I initially thought it was a finescale live steam model, but in fact it's a lovely example where someone has taken a kit well beyond a simple assembly. Trade was pretty good. While less than half the size of the 16mm AGM a month earlier, there was plenty to see and buy. Both box shifters and more specialist stands were present, although neither appreciated the rubbish mobile phone coverage the venue is notorious for when trying to use the card machines. Crowds were thinner than perhaps you might expect, not great news for the organisers but it made walking around a real pleasure, as did the excellent cafe opposite the entrance! 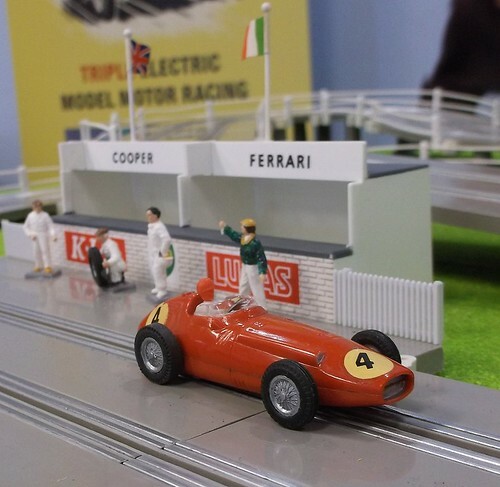 After all the lifeboat fun, Saturday afternoon was given over to the UK Slot Car festival at Gaydon transport museum. Last year's swapmeet whetted our appetite so my dad and I were keen to see the main event. The show is pretty much split into two. 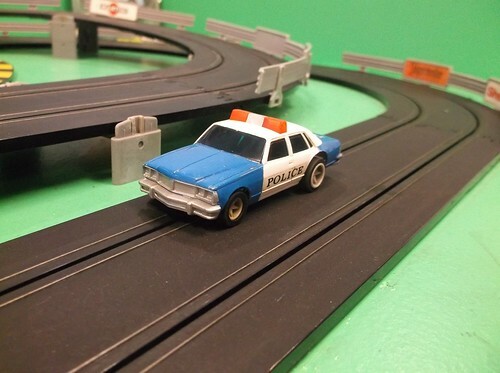 As you get up the stairs you're thrust into the trade area with stands selling everything from the market leader Scalextric to esoteric resin kits, spare parts (new and second hand) and loads of scenic materials to make your track look realistic. Beside this is the main hall of working tracks. The centrepiece is an 8 lane track of very substantial construction. When we arrived, there were time trials going on with what appeared to be 1:32nd projectiles. OK, they were sort of car shaped but also sort of concave wedge shaped. 6.5 seconds for a lap seemed to be the best time, certainly impressive but to me only a single step away from a video game. The controllers were impressive though, knocking the multi-button DCC train versions into a cocked hat. Several looked distinctly home brewed but there were more professional versions for sale. Chatting to one owner, the knobs etc are used for tuning the cars response, acceleration, braking etc. It all looked horribly complicated to me but I expect this is what you need to compete at the highest level. We did have the chance to get hands-on with some simpler setups. 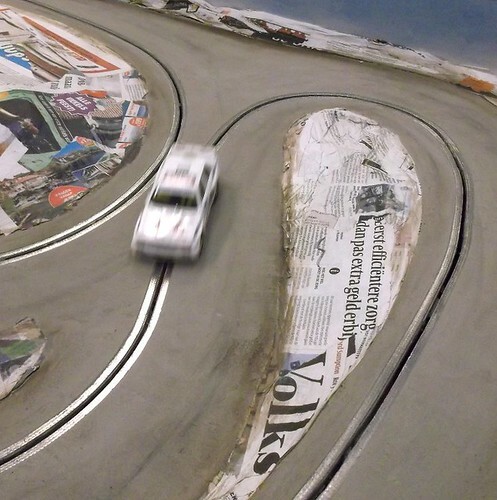 I say simpler, but the Luton clubs single lane time trial track had a particularly tricky corner which caught me out a few times sending the car spinning off the track. I'm sure with many hours of practise I could pick up my lap times, although I was just as interested in how the lovely buildings were made. 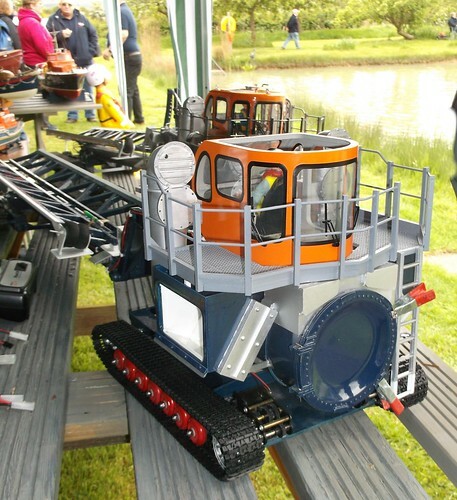 One of the most impressive things about the show was the efforts made to get people to have a go, especially children, or maybe they were just less bashful than the adults. Several tracks were open including a couple of drag strip versions. I managed to have a go with some Wren Formula 152 models which really appealed to me. Sadly, horribly rare nowadays, there is an excellent website covering all the products in the range. The real treat thought, was the Matchbox slot car range. I remember coveting the "Race & Chase" set when I was a kid. I mean who wouldn't want one after adverts like this? Anyway, I would look through my mum's mail order catalogue and wishing I could have one. It wasn't really the racing that appealed, although the weekly Saturday fix of The Dukes of Hazard certainly made this appealing, I wanted to know how the cars spun around. Well, after explaining this to the owner, I got to try the police car. But I couldn't make it spin! It seems that the Race & Chase controllers had an extra button on the top. When pressed this reversed the polarity of the power initially making the car shoot backward. On reaching the corner with extended edges, it carried on straight until momentum caused it to whip around and point the right way. Very ingenious - knowing how it works you can see what's happening in the video. 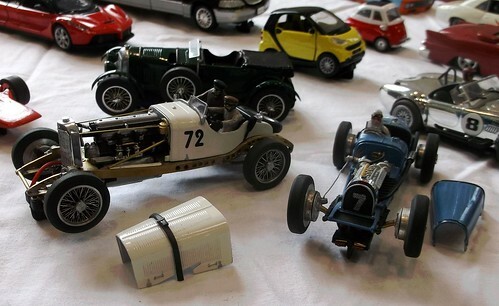 In more conventional models, the huge variety of cars on sale, and the level of detail now on RTR models impresses me. 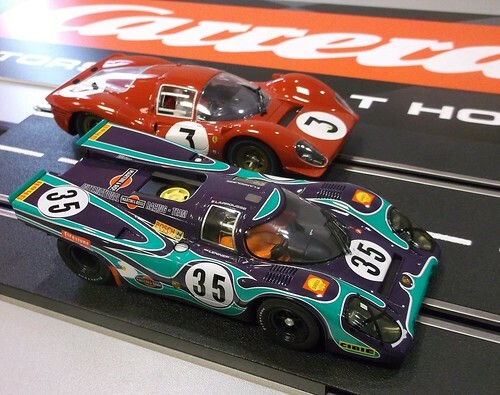 I think these Carrrera cars are 1:24th rather than 1:32nd but the (slightly) smaller scale versions look just as good. Or if you prefer hand-built, then one guy was merrily making all sorts of things run on slots, including these rather nice scratchbuilt models. If all this wasn't enough, entry includes access to both the Leyland museum and new (to me) Jaguar collection. Loads of photos over on Flickr. Last Saturday, I spent 3 hours in a car park. Well, more specifically, parking cars for the KMBC annual lifeboat day. I had my hi-viz jacket to protect me from the chilly wind and an RNLI baseball cap so I looked quite the part. This means I saw a lot of boats briefly through the back windows of cars. By the time I decided that pretty much everyone who was coming had arrived, and some of them had already left, the boats were on the water. 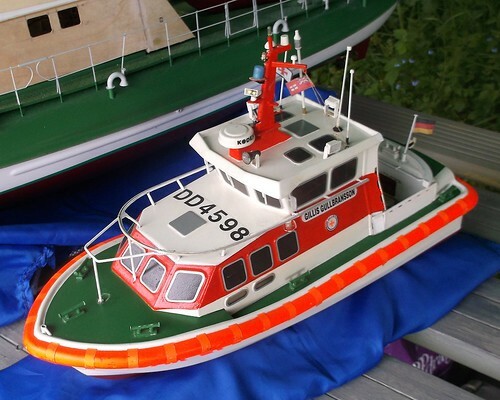 One model that aroused my interest more than most was a scratchbuild retrieval system for the newest boat in the RNLI fleet - the Shannon. 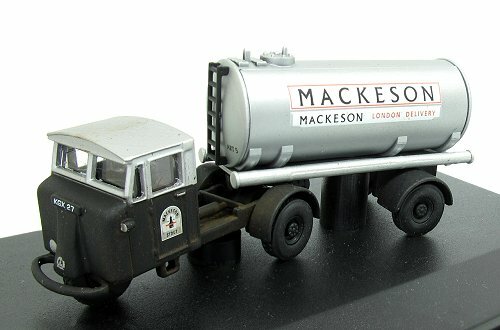 This amazing waterproof tractor and long trailer combination makes for a really striking model and not one you'll find on the shelf in kit form any time soon! While boats are the main interest, the ancillary equipment is far harder to build and yet just as fascinating. 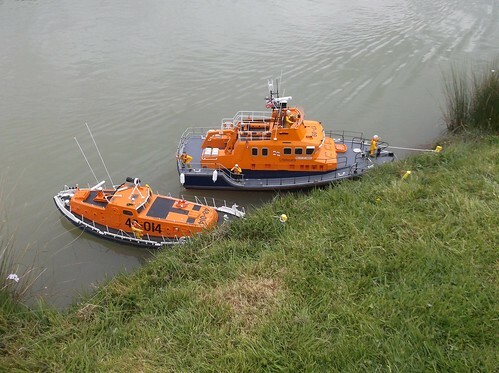 The boat can be hailed up the channel on the trailer and then the whole lot spun around ready to be re-deployed quickly. An amazing bit of engineering. My collection of Manx railway books is pretty impressive but the latest addition might be one of the most unusual. 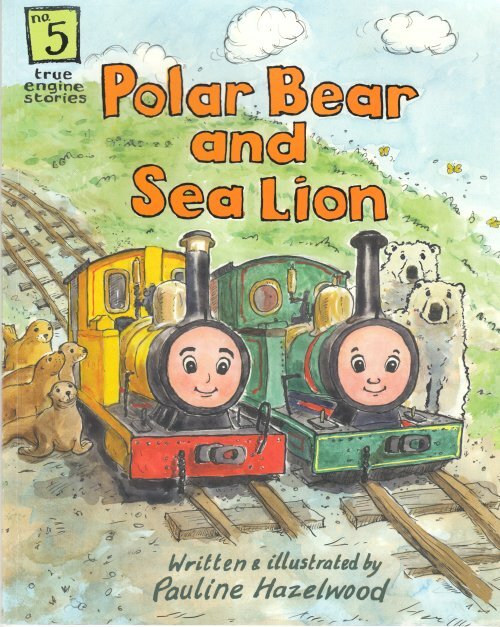 Aimed at children, Polar Bear and Sea Lion accurately tells the story of how the Groudle Glen Railway came about. Readers learn about Mr Broadbent and how he turned the Glen into a tourist attraction. The results were so successful that he decided to add a railway, partly to help people reach the zoo at the end of the glen and partly as an attraction in itself. 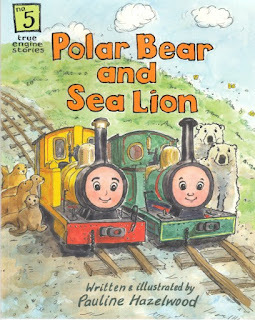 As students of the line will know, this too was popular, so much so that Sea Lion had to be joined by sister engine Polar Bear. Basically, what we have is an enjoyable tale perfect for the bedtime story market, that is based in fact. You get to sneak a little history in without anyone noticing. Best of all are the delightful illustrations, full of colour and life. Kids will enjoy all the funny figures and in this case, interesting animals too. A really nice touch are the maps of Man front and back. At first glance I thought they were the same but in fact the front one is a Victorian map, the back the modern day showing the difference in railway and boat services on Monas Isle. Spotted in a Banbury back street, a BT telephone kiosk. A KX200 for phone box anoraks, what you'd need to wear to use this in the rain. Amazing to think how old fashioned these things are. Who uses a call box nowadays? 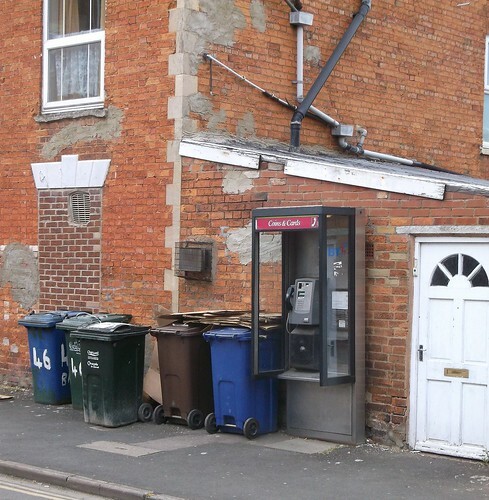 Dating from the 1980s, these replaced the much loved red telephone boxes, a move signalling the end of civilisation and the descent for society into squalor and misery. Time has not been kind to the KX's. Most have been uprooted as demand plummeted thanks to the mobile revolution. To find one tucked away in a side street in company with another modern phenomenon, the wheelie bin, is a surprise. Modellers will need to scratchbuild this kiosk model as the nearest kit I know of is for the KX300, a standalone triangular model. Mind you, we aren't exactly talking a difficult project here. None of your fancy curves or anything. Not like a Mercury kiosk! Is this a real GWR plaque? 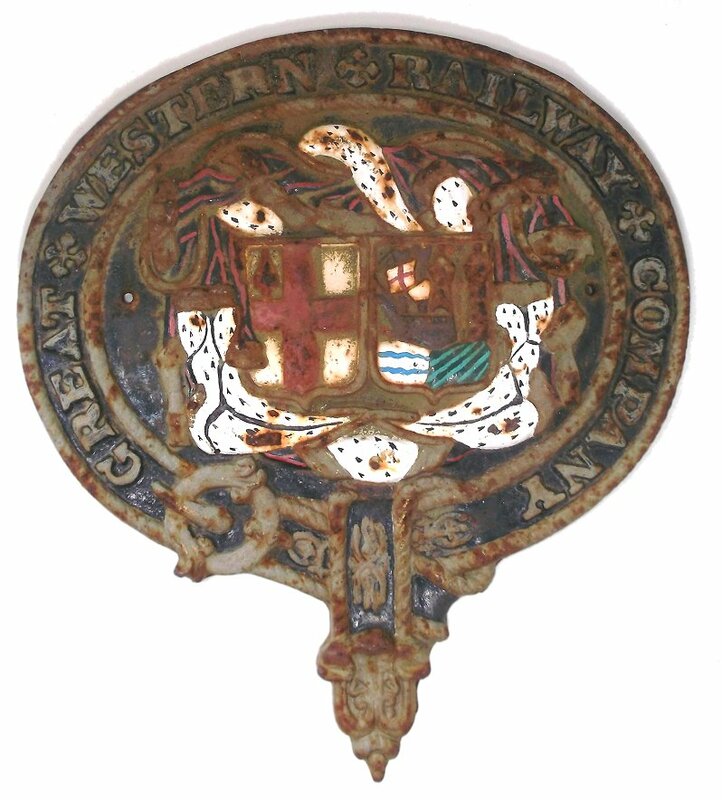 Bought this weekend for a tenner, this is a cast iron GWR coat of arms. Obviously it needs restoration, that was most of the appeal. Well, that and the price. What confuses me is, is it real? I don't mean does it physically exist, that is a definite. 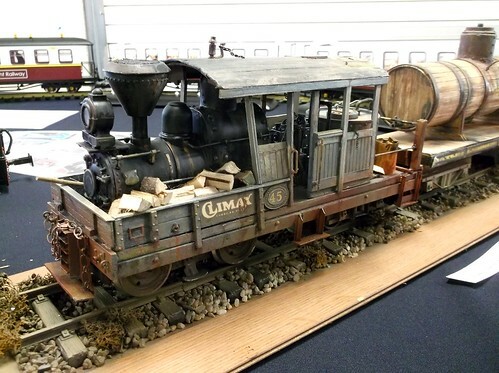 What I want to know is, is this a real GWR item? How could I tell? The piece is 11 inches wide and a tiny bit over 12 inches tall. 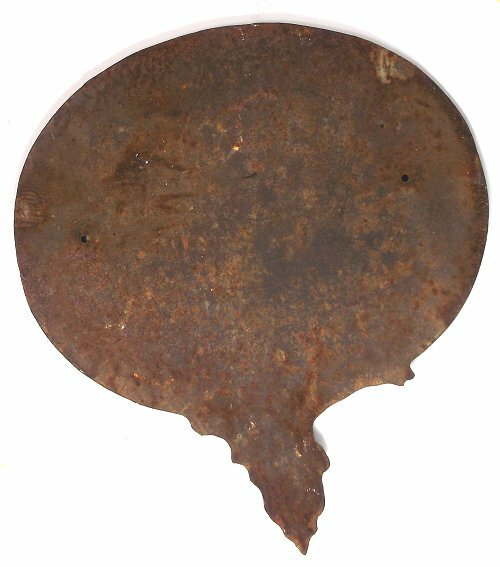 Weight is just under 7 pounds - it's scrap value alone is a couple of quid. Two holes 19cm apart are cast through it. Assuming this is a replica, or casting taken from a real plaque, what was it's original use? In the capital for a drink with friends last week, I strolled across Westminster bridge. The tourists were busy photographing parliament, taxis and double decker buses. 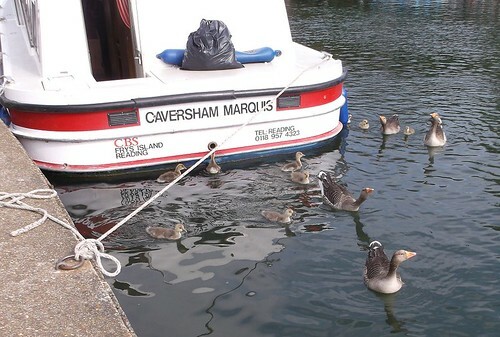 I pushed my way through the crowds to look at the rather more interesting traffic on the river. 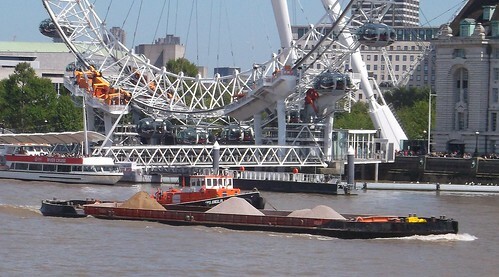 A tugboat tied alongside a gravel barge. Not a difficult modelling subject if you are willing to use (gasp) foreign plastic kits and ignore the difference between OO and HO. 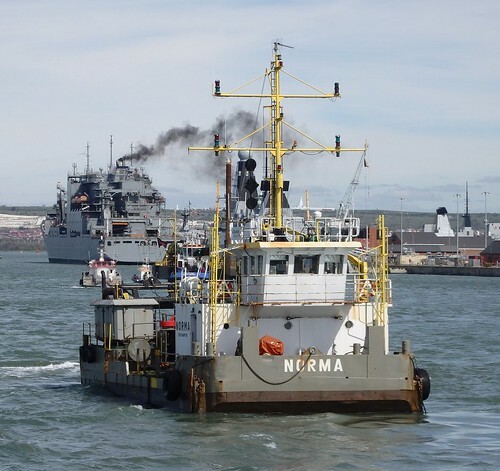 The tug is over 50 years old - full details here (PDF).You can even see where she is, has been and how fast she did it. 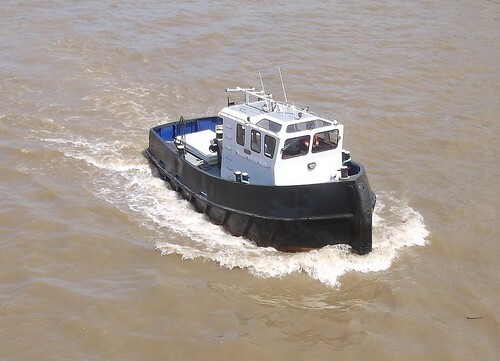 A few moments later, this rather nice little tugboat pottered under the bridge. Can't tell you anything about this one but you'll be able to judge the size from the visible captain. Tiny.If I could find a hull, it would make a great 1:12th scale model (not that I need more projects) or perhaps even bigger. 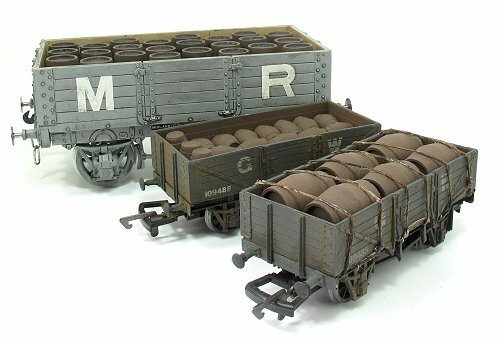 A new show to me, the ALSRM cover scales from O gauge upward so I was expecting to see plenty og G1 and the garden railway scales. The first surprise was that Reading station is really impressive. Modern and a good looking design based around soaring escalators taking passengers up to the floor where you transfer between platforms. Next, I work out that the stroll to the venue can include a wander along the Thames if I'm prepared to accept a 5 minute longer journey. I was early, so I did. The show takes place in a leisure centre. Roomy but slightly odd in that you go in through a side door that I suspect is a fire escape during normal hours. Not to worry, the first hall is pure trade. I had planned to chat to a lot of people so made my way around this until lunchtime. First stop was Mercian Models to drop off a half-built O gauge USA tank. I was glad to get rid of this, there were a heck of a lot of whitemetal castings in there! Next to the trade hall is another big room with the layouts. I've not seen this split before, the trade usually prefer to be mixed up with displays for fear of missing those punters who only go to gawp. Presumably, like the GOG trade shows, everyone through the door has money burning a hole in their pocket so they will all promenade around the purveyors of model railway items. 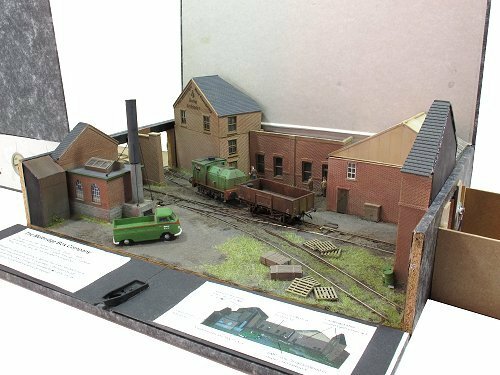 One of the layouts I was looking for was Trowland, Trevor Nunns latest S gauge model. 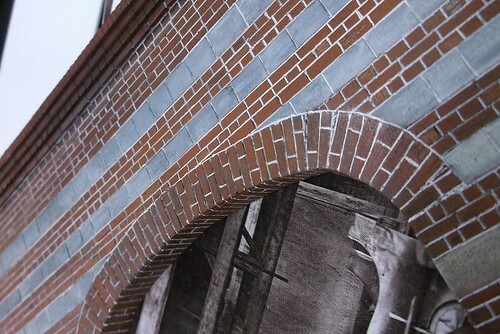 Chatting to the man himself, I asked how he did the brickwork as I didn't think you could buy anything pre-made. It seems you can, from New Zealand, but he scribes his own. I found myself pointed at a nearby demo to learn more about working with foamed PVC, sold by 4D Models as Palight. I've heard of this before and have something similar to try out on a project, but it's always enjoyable learning a bit more. There were many other chats around the place including one while sitting down eating a cheese sandwich followed by banana and pecan cake. This was certainly a very friendly event. 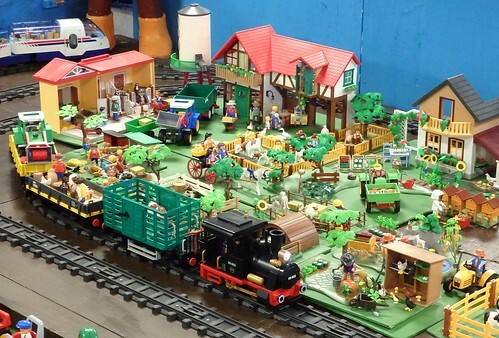 As promised, there was a huge variety of scales including several garden railway size models. Very different from anything else I've been to but perhaps an odd crossover that might confuse the more conservative modeller. Perfect for me though.